Crack in America is the definitive book on crack cocaine. In reinterpreting the crack story, it offers new understandings of both drug addiction and drug prohibition. It shows how crack use arose in the face of growing unemployment, poverty, racism, and shrinking social services. It places crack in its historical context—as the latest in a long line of demonized drugs—and it examines the crack scare as a phenomenon in its own right. Most important, it uses crack and the crack scare as windows onto America's larger drug and drug policy problems. Written by a team of veteran drug researchers in medicine, law, and the social sciences, this book provides the most comprehensive, penetrating, and original analysis of the crack problem to date. It reviews the social pharmacology of crack and offers rich ethnographic case studies of crack binging, addiction, and sales. It explores crack's different impacts on whites, blacks, the middle class, and the poor, and explains why crack was always much less of a problem in other countries such as Canada, Australia, and The Netherlands. Crack in America helps readers understand why the United States has the most repressive, expensive, and yet least effective drug policy in the Western world. 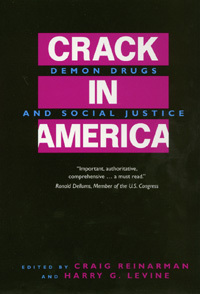 It discusses the ways politicians and the media generated the crack scare as the centerpiece of the War on Drugs. It catalogues the costs of the War on Drugs for civil liberties, situates crack use and sales in the political economy of the inner cities in the 1980s, and shows how the drug war led to the most massive wave of imprisonment in U.S. history. Finally, it explains why the failures of drug prohibition have led to the emergence of the harm reduction movement and other opposition forces that are changing the face of U.S. drug policy. Craig Reinarman is Professor of Sociology at the University of California, Santa Cruz. Harry G. Levine is Professor of Sociology at Queens College and at the Graduate Center of the City University of New York.